PASCH stands for the initiative "Schools: Partners for the Future." It links around 1,500 schools in which German has a particularly high priority. “Schools bring our language and our culture closer to the youth and help build a long lasting and resilient network of friends and partners of Germany. We want to be open to the diversity of cultures and tolerant of the autonomy of others. We need more places than ever of understanding, shared learning and creativity. Our partner schools abroad are such places. I invite you to become acquainted with these schools. " The PASCH project is an initiative of the German Foreign Minister Mr. Franz Walter Steinmeier. Launched in February 2008 in Indonesia by the ´German Foreign Minister himself the project has been a resounding success worldwide. The aim of the project is to build a network of over 1000 partner schools worldwide, who would be networked together to build a family of global German learners in leading schools around the world. The Foreign Office chose the Goethe- Institute, the Central Agency for German schools Abroad (ZfA), the German Academic Exchange Service (DAAD) and the Pedagogical Exchange Service (PAD) to implement the Pasch initiative on its behalf. As a first step the Goethe-Institute and the ZfA were given the task of identifying 500 schools each and bring them aboard the Pasch family ship. 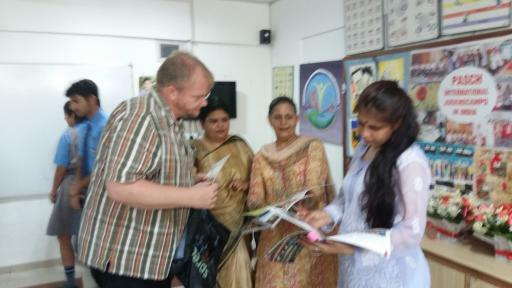 The Goethe Institute Max Mueller Bhavan in India received the target of 39 schools. The criteria for identifying the schools was that they should be centers of academic excellence, promote the holistic development of its students and should either have German as a part of their curriculum or should be willing to offer German in their schools as a subject in the very near future. assistance in implementing the curriculum of the school board. In fact members of the Pasch team have been part of the team reworking the curriculum at the CBSE making it more communicative and contemporary. The partner schools also support the schools by providing the infrastructure for a modern well equipped German classroom. This German room as well as the library of the school are stocked with books and multimedia materials that make learning German a pleasure. The films and easy readers are specially popular with the students. Another important aspect of the programme are the visits of delegations of principals to Germany. These trips to Germany go a long way in familiarizing the principals with the German education system, the functioning of German schools and a firsthand experience of the benefits of this interaction for the formative generation. The Pasch schools also benefit from the additional opportunities this network offers, like the students exchange programme run together with the Pedogogical Exchange Service in Germany. A large number of Indian students travel every year to Germany, attend school, stay with their host families and in return their German exchange partners visit them in India. This provides the student groups, a chance to get to know each other, through their schools, lifestyles, families and homes and working together on structured socially relevant projects, there by becoming the fertile ground for many global potential partnerships in the future. Rock concerts, exhibitions, science experiments demonstrations, painting competitions and German film festivals are some of the other programmes we offer the schools. The German teachers in schools, who are the interface between the school and the students are a vital link in the network. They benefit from being constantly updated in their knowledge of didactics and methodology of teaching German as a Foreign Language. The Goethe-Institute offers generous scholarships to all school teachers ranging from four to eight weeks in Germany for them to refresh their knowledge of German and hone their skills in teaching. “These courses help us to update our language and teaching skills, besides providing us the opportunity to experience first hand, how things work in Germany, how do the people in the country think, providing us a global perspective and enabling us to make our classrooms forums fertile grounds for cross cultural training, says Ms.Neela Tatu, German teacher at the Mallya Aditi School in Bangalore. To prepare the future teachers better for the teaching profession the Max Mueller has signed an MoU with the Indira Gandhi Open University to offer a Diploma in German Language Teaching. This is a distance learning programme that will allow young budding teachers skills to face their students with more confidence and plan a better class. All our programmes ultimately aim at benefitting the student and the learning community at the Pasch partner schools. The well equipped classrooms, the interestingly stocked library, a communicative curriculum and well trained teachers are some of the advantages the students have, but this is not all. Every year the Goethe- Institute offers German language camps for school students learning German. These students, encouragingly selected in their schools, fly to Germany for three weeks where they get the opportunity to participate in an international camp of students from all over the world and collectively participate and learn German together for three weeks. The camps activities are not restricted to the classroom but include other leisure activities including study tours in the vicinity of the camp. Shaurya Punj of Vivek High School, Chandigarh, gushes, “This is an experience of a lifetime. I never knew Germany was so green, so beautiful. I would love to visit Germany again. pIn 2010, the Max Mueller Bhavan offered two camps in India for students of Pasch schools in South Asia. The camps were held in the Delhi Public School R. K. Puram, New Delhi and in Thekkady in Kerala. 140 students took part in these camps, and they came from countries all over South Asia. Even 10 Japanese students, and two of their teachers found their way to the camp in Thekkady. It was another kind of adventure that 11 students embarked upon when they left Delhi for Thailand to join other German learners from Thailand, Indonesia and Japan. Workshops on creative writing, scientific experiments , sports were on the very successful agenda. The interaction between the students from various Asian countries where the only common language was German is an experience they are not likely to forget very soon. Abhineswar Das, a participant at the camp, says, “I never knew the Japanese could dance this well, that the Indonesians had 1700 islands in their country or the rain forest in Thailand could be so beautiful.He learnt all this while learning German. These camps have now become a regular annual event which the students look forward to. The initiative strengthens and connects a global network of 1,500 partner schools with special bonding Germany. In young people it is sustained interest and enthusiasm for modern Germany and the German language are aroused - especially in the key regions of Asia, Middle East and in Central and Eastern Europe. The Foreign Ministry coordinates the partner school initiative and puts them together with the Central Agency for Schools Abroad, at the Goethe-Institut, the German Academic Exchange Service and the Educational Exchange Service of the Standing Conference. The German Parliament has supported the initiative from the start and "to strengthen and develop German schools abroad and" its importance for school work abroad with the resolution highlighted to develop fruitful and long-term ties with Germany and inspire schools, their teachers and students to interact with each other and work together. Therefore, the initiative supports schools with a wide range of measures available. PASCH with other initiatives of the international cultural and educational policy is linked, as the voluntary service "culture-wide", the research and academic initiative and the initiative "German - Language of Ideas". Three teachers from our school, Sharanjot Chahal, Anjali Punj and Vrinda Sharma, volunteered to be trained under the PASCH programme. Their training started on 12 January 2009 and culminated in September 2009 after 7-weeks of hands-on training at Goethe-Institute in Germany. The teachers were taught the language - reading, writing, speaking and hearing in an intensive course. In Germany, they interacted with the people around them and are now proficient in understanding and speaking the language. This has enabled them to effectively begin conducting classes in the teaching of German in the school. These teachers are now the member of Indo-German Teachers Association (InDaF). They attended a 2-day International Seminar on the occasion of “20 Years After The Fall Of The Berlin Wall at Panjab University, Chandigarh and Hotel Mountview, Chandigarh. The seminar was organised by InDaF in collaboration with Max Mueller Bhavan, New Delhi and Department of German, Panjab University, Chandigarh. Mr.Mushtaq Ahmed was selected as part of the South Asian PASCH delegation that visited Germany in December 2009, to familiarize themselves with the education system in Germany. Mrs. PK Singh and Mrs Renu Puri have attended the Annual PASCH Principal’s Conference in Colombo. Our students participated in Quiz on Germany conducted by DPS society in collaboration with Max Mueller Bhavan, New Delhi. Language course in Germany has been a great learning experience for teachers as well as students. They learnt about culture and society and also about teaching methodology used in Germany. German has been introduced as one of the options for 3rd language from class V onwards in VHS, Chandigarh and as a club activity in VHS Mohali. Teachers use audio aids for improving listening skills and the computer as a video aid. Vivek High School is looking forward to a working partnership with German schools where an interaction/exchange could take place via video-conferencing and exchange programmes that would bring about great interaction from both sides. 11 students have benefitted from the PASCH programme as they have attended the International Youth Camps in Germay. The PASCH Programme at Vivek High School is going from strength to strength. With a meagre strength of just 11 students in 2009 we now have 66 students learning the German language as a 3rd language option. We also have about 12 students who have been involved actively with the PASCH programme and have benefitted immensely by going to Germany for the Jugendkurs organized by PASCH.